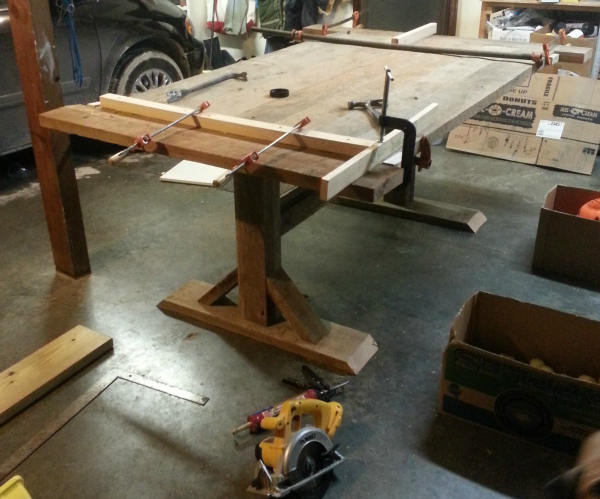 This, my friends is what inspired Nathan to make my long-drempt-of farm table. 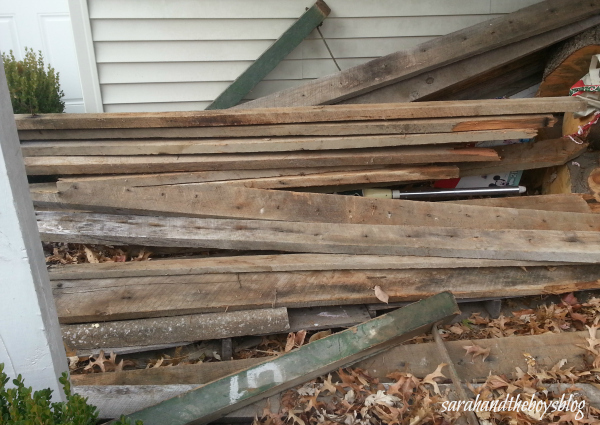 Now if you saw this pile of lumber, would you think you could make this? I’m pretty sure I wouldn’t have the ability or confidence to work that sort of magic. But Nathan is one talented guy, and he was able to turn this old wood into a beautiful piece for us to love for years to come. The wood was part of an old machine shed/barn that was knocked down to make way for growing retail development not too far from our home. 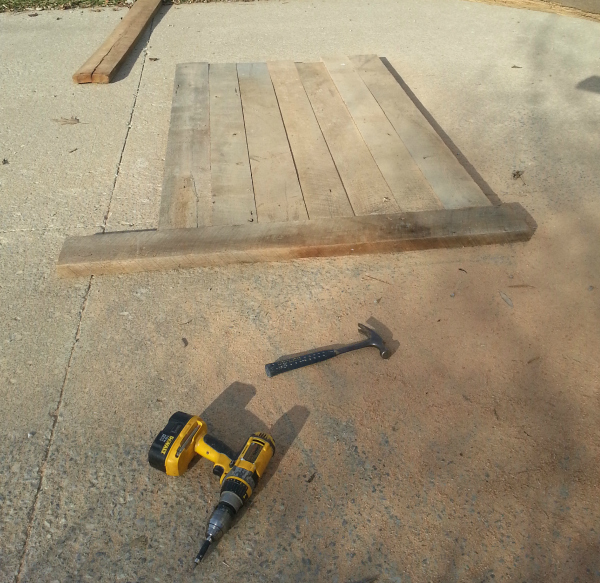 Nathan went by one Saturday afternoon and helped himself to some of the scraps of wood that were salvageable. Two days later it was all burned. So sad. 😦 The wood was very rough, uneven, different thicknesses, etc. The first part to his puzzle was making sense of the wood and fitting the pieces together. This probably took him a solid day, just to make it look like it was meant to be together. 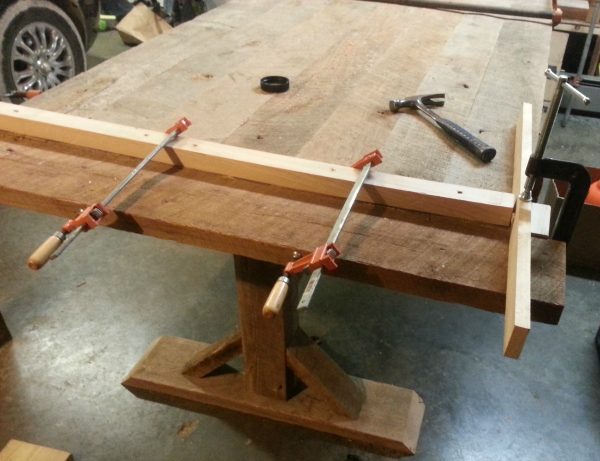 Once he had the boards in an order that he thought work work, the table top began to take shape. 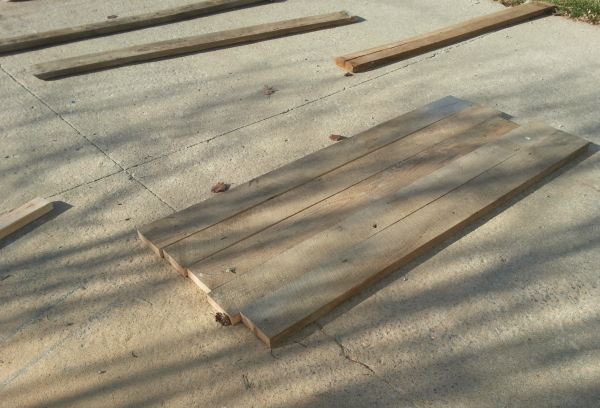 As I already mentioned, the wood was very cupped, uneven, warped. That’s what comes with the territory of old wood. 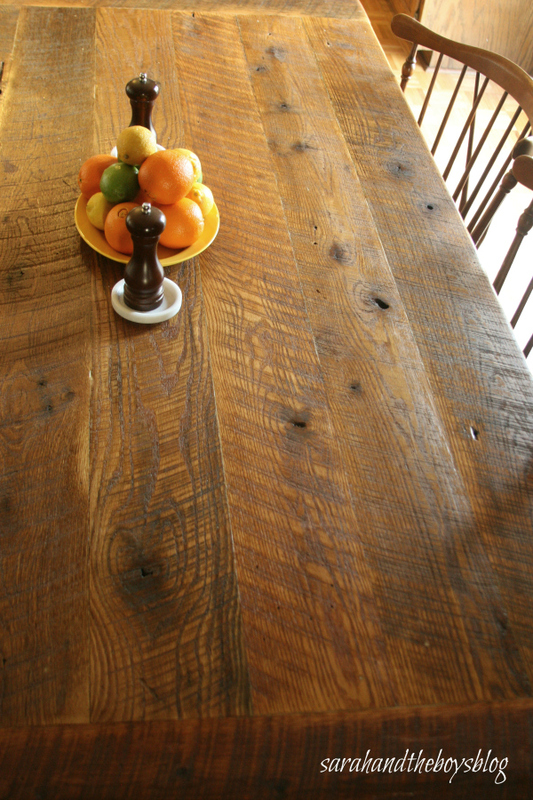 The beauty and character of reclaimed wood also comes with challenges. We don’t have a lot of photos of the entire process…this was pre-blog. He shaved a lot of boards with a wood planer, but tried to leave the top untouched, and do all of his thickness adjusting on the bottom side, which would not be visible. And for those that have asked, his pieces are held together with biscuit joints and wood glue. 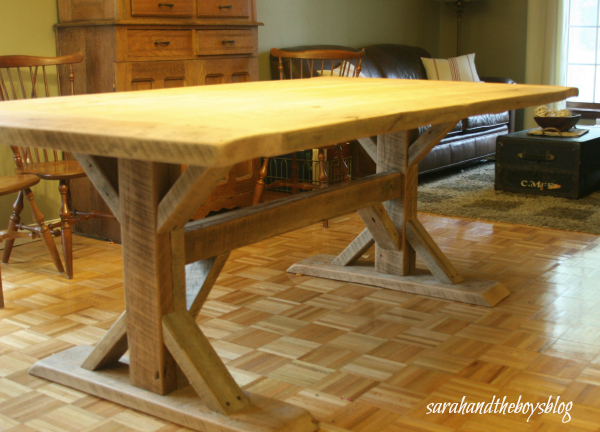 A lot of farmhouse tables have four legs, but we designed this table to maximize flexibility in seating arrangements. Having the support in the middle, instead of at the four corners, helps this table seat a lot of people. Now if you look closely you can see the boards are still pretty rough at this point. He spent probably a day total sanding this piece, using a belt sander (thanks, brother!) and a hand-held palm sander. He was careful to sand it so that it was not too bumpy, but not to the point where all the rough-sawn cuts were sanded away. Once he got to the place where it was sanded to his liking, we took it inside. Please excuse the poor photo quality. But you get the drift. This was the table pre-finished. We let it sit inside for a good, long time. Perhaps six months like this? We moved it inside to let the wood acclimate before our final sanding and finish. I LOVED it unfinished. Very reminiscent of a table you would see at Restoration Hardware. But we had to keep it covered with a piece of clear plastic from the fabric store to protect it from stains. Classy. *Polyurethane: we decided against this type of treatment because we didn’t want the “plastic” look that comes with polyurethane. Poly sits on top of your wood, so it leaves more of a coating. We have three boys, and this table gets hard use. Poly would have been durable, but also has the potential to get scratched up. When it does, the only way to fix the scratches would be to strip and re-coat the entire table. Plus, I didn’t think a plastic-feeling coating went with the same vibe as a farm table. *Wax: many will simply put furniture wax on a piece like this, and you can preserve the light finish like this table has. I would have loved that option if this table was for show, or for a dining room that is not used often, or for a home with no kiddos. Since this table is used DAILY, we needed something that would be able to handle the wear and tear, that would not need maintenance. *Oils: hemp oil or other oils could have been a more natural option as well, but, again, I didn’t think the oil finish could stand up to my kids! *Unfinished: this is an option, but you need to be okay with the table soaking in every water mark, spill of wine, crayons, etc. I wouldn’t have been able to handle that! 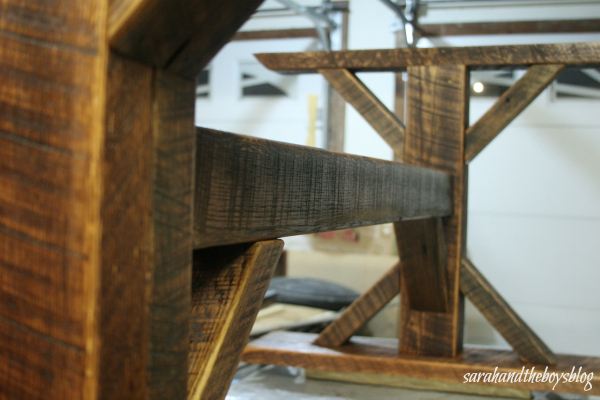 *Waterlox: we decided to go with Waterlox because it is a durable finish that could make this table able to withstand the abuse that we were going to give it. The great thing about Waterlox is that it is like a poly and an oil in one. It soaks into the wood, so that if you ever have a scratch, etc., you can lightly sand that area and touch up the scratches, but it has the durability of a poly. Perfect for us! Also, because it soaks into the wood, it looks more natural than a poly that sits on top of the wood. Many folks use Waterlox for their butcher block counters, even in kitchens, around their sink (check out Miss Mustard Seed’s counters here or Holly Mathis Butcher Block Counter’s here). We decided not to stain our piece before we sealed it. If we would have had less rough-cut marks, I probably would have stained it first. But I did several test pieces, and decided that if I stained it, some parts of the table would get too dark. If you ever use Waterlox or poly, make sure you test it out first and decide if you need to stain it. We applied the Waterlox in a well-ventilated area. Did you catch that? Well-ventilated is important. This stuff is stinky. If you want something that is low-VOC, this is not it. Restoration Hardware sells many of their tables raw (yes, you pay $3000 for a table, and then you get to finish it!!! ), and they have a low-VOC sealer they recommend, but it was pretty expensive and I wasn’t sure of how durable it would be. So, we went with the uber-stinky Waterlox. We applied the finish with a cheap, 4″ chip brush. Between each coat it went inside some plastic bags, in our freezer outside. I wouldn’t do this forever, but we worked this product back-to-back days. We waited the recommended time between coats, and make sure the space was well-ventilated. From my research, the curing process happens from ventilation. Even if the temperature is colder than ideal, the ventilation is the key. See how the can is smashed? 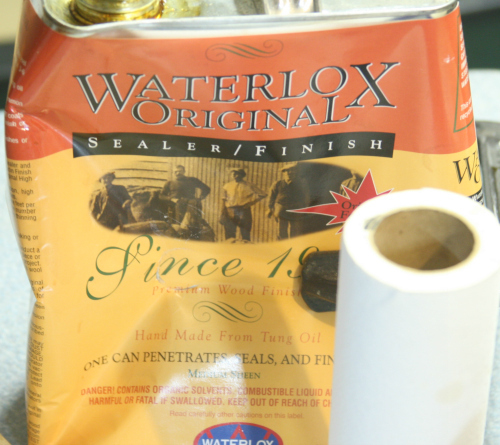 This is on purpose–Waterlox will last forever, but you need to keep the air out of it. So Nathan used a clamp (see photos above this one) to smash the can as we used the product, keeping the can “full”. Make sense? We applied 3 full coats to all sides of this piece and 5 on the top. Everything. Folks that use Waterlox for their kitchen counters seem to do 4-5 coats or more. If you don’t want the shiny look that comes along with additional coats, you can finish your last coat with Waterlox’s flat finish (we used the original for all coats). I didn’t want to spring for an extra can, but it’s not a bad idea if you want your finish to be matte. 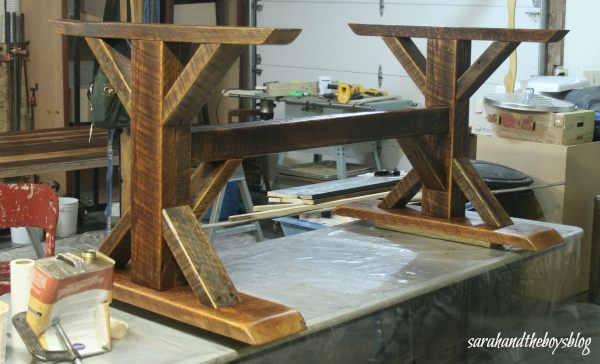 We LOVED working with the Waterlox. It is so much easier than applying a polyurethane. Our favorite thing about this product was the ease of application. Waterlox is easy to apply, you didn’t have to worry about over-working it, this had no sags, no runs, didn’t bubble, this was so.much.easier. This sat outside in our garage for a few weeks de-stinkifying. We brought inside, and I have the super-sniffer 3000 nose, so it still smelled for about 3 months, in my opinion. Not strong, but when I got up close, I could smell it. We were gentle with it at first, not really using it much for at least a month. It is holding up beautifully. Thanks for reading! If you have any questions about the process, please feel free to ask and the smart one (Nathan) will answer! 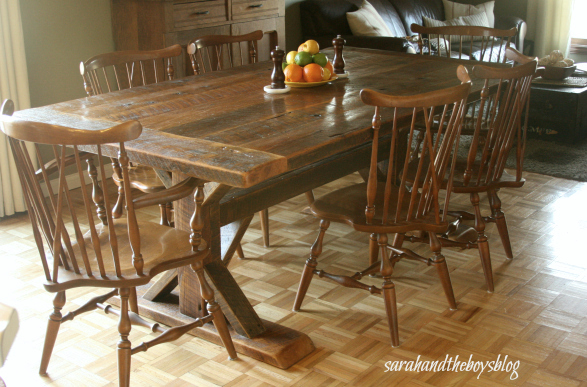 How We Went From Scrap Wood To Family Farm Table first appeared on Sarah and the Boys Blog. For more posts like this, sign up for emails or follow on Facebook or Instagram! Looks great!! It reminds me of a table Grandpa Newt made. Bi, I just found your blog from Miss Mustard Seed. 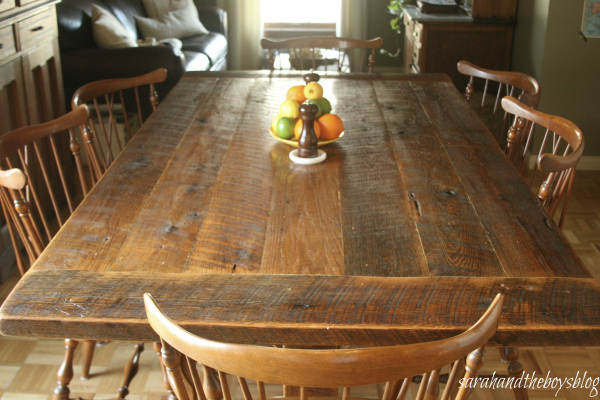 This table is absolutely gorgeous–kudos to your husband! My hubby and I built one from a fallen poplar tree that his dad had on his farm. His dad has a portable sawmill and cut the wood into boards. It is very rustic and well-used by our 7 year old daughter. We stained ours and did the matte poly and it’s been holding up well but we’ve got playdough, glitter, paint, crumbs and who knows what else stuck in all the grooves! 🙂 Such is the price we pay for rustic! Thank you for including all the specifics on planing, sanding, not staining, etc. I would like to try the Waterlox at some point. Thanks for sharing! Oh I’d love to see photos of yours, Melissa! Ours has holes and knots, I’ve found that I vacuum it out once a week and it helps to get stuff out before it’s totally ground in. We found that my son (2yrs) can fit 7 pennies in an angle in one of the knot holes, hehe. What a lovely table! We are building a very similar one right now and trying to get the twisting and warping out of the boards before joining them together. If possible could Nathan give a few more pointers on how he got some of that out of the boards without sacrificing the saw marks or thinning the boards down to nothing? It looks like the seams came together so nicely! Did he have to use filler at all or did he really get them that snug somehow? !